Modern coastal design updates continue in my home and are flexible to allow for seasonal changes. A few favorite thoughts and what’s new! As a careful shopper and a fan of eclectic design, I am constantly updating with small changes as budget permits. 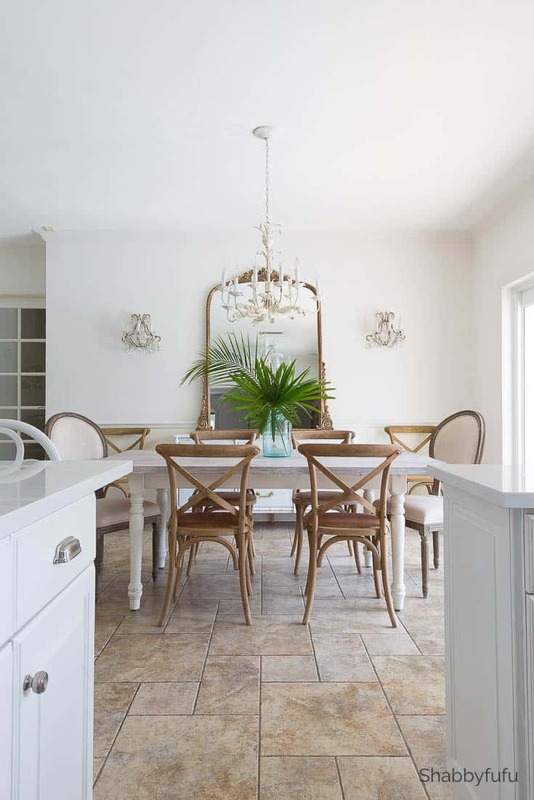 Ever since we revamped the kitchen, the adjoining dining area was next. I talked about the thrifted dresser that I transformed in THIS POST and once it was in place I was so happy to see the beginnings of a fresh, modern coastal look! With a love of light design and living in Miami I am leaning more towards modern coastal design than ever. It just feels right and I think looks right too. My daughter called it “Frenchy, coastal, boho…but I don’t see the bohemian part here, LOL. I still love French design but modern with a French accent. Less clutter and more simple and some accents that you can add will be listed below. I have patiently been waiting for a long time to purchase this mirror and when it went on sale I knew that it would be the one. The one to tie in my love of French design with a modern mix. It definitely has an antique look and is new, and made to freestand or lean with a flat base. 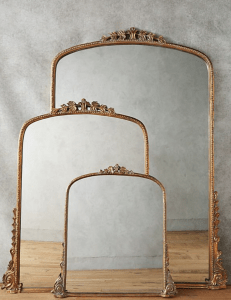 The old mirror will be for sale locally and has a more shabby chic look. I’m still keeping the walls mostly bare in my home with a few mirrors and sconces as accents. 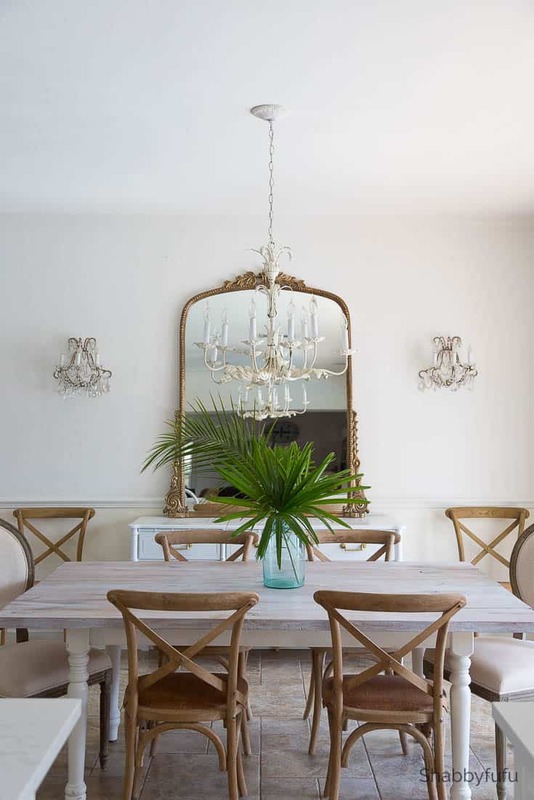 The mood is calm and uncluttered and a large mirror is the statement piece and reflects light. I’m limiting furnishings to what is necessary and as always accenting with flowers and clippings from the garden. White walls and muted tones of blues and pinks. 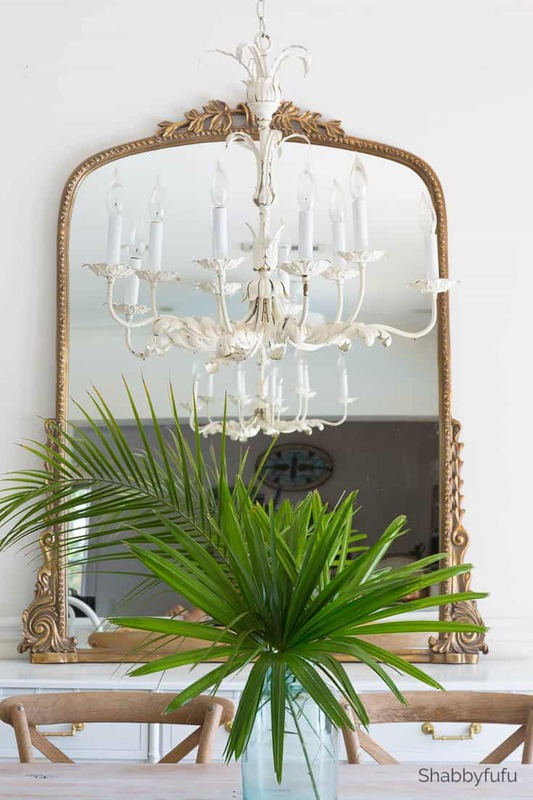 The antique French wall sconces with crystals have a similar patina to the mirror, and help mixing something new with something old. 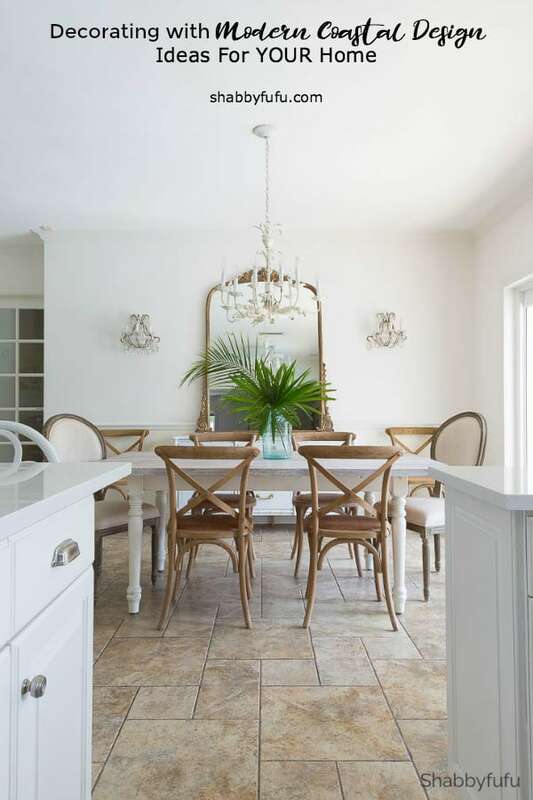 – Whitewashed wood tones (see how to WHITEWASH a table quickly), driftwood accents in furniture and lamps. – Add something in aquamarine or turquoise if you dare. In THIS POST I added some aqua pottery and glass and it instantly changed the look to coastal chic. – it’s trending right now, but a trend that is timeless. Find some bamboo chairs and paint them, or a bamboo look dresser as mine in this room! – Sadly I’ve had to give up on rugs for now due to my little rescue pup. A seagrass rug or striped nautical in pale blues would be a perfect modern coastal design touch. I’m on the hunt for a true plastic area rug that is chic and can be hosed off outside. Will let you know! – I see so many people doing the same exact thing, like fiddle leaf figs and succulents. 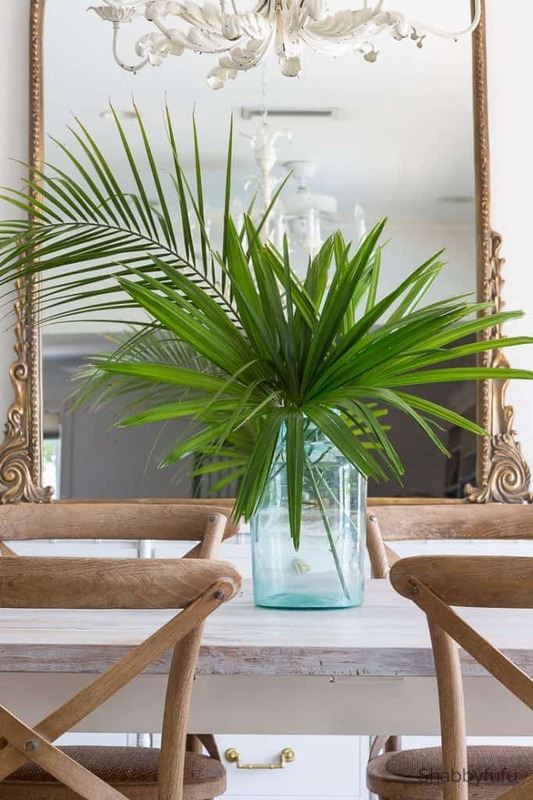 Try something like a palm or ferns instead, or clip from the garden and bring life to the room. LOVING my new countertops from Hanstone Quartz and I just ordered a new rug for the dining area that I’ll share soon. I think that my biggest piece of home decorating advice would be to do your own thing. Dare to be different and you do you! 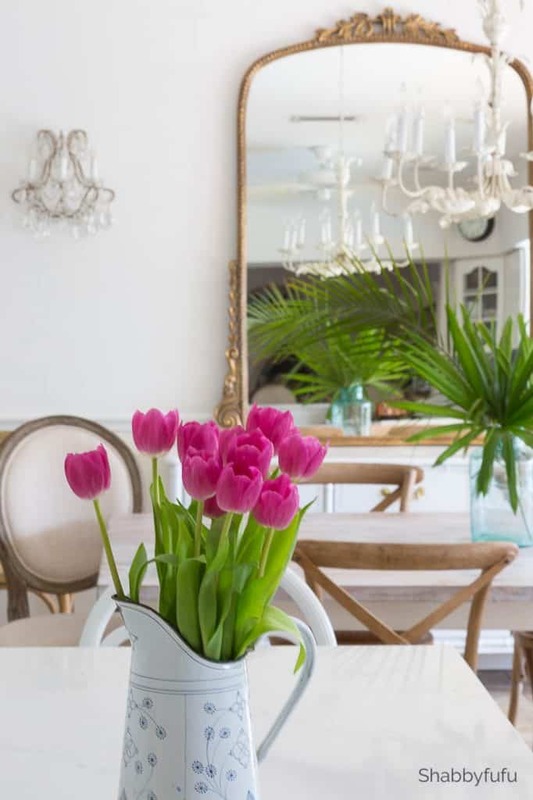 Follow your heart’s desires and design your home slowly as your budget allows and tastes change. I have some favorites that I’ve found below to shop for. Simply scroll and click on the images to learn more! Love that pretty mirror. Everything always looks beautiful. Luv the room…that mirror is WoW ! Anthropology is FUN and different. I MUST ‘start’ and de-clutter !!! I snickered… I love the fiddleleaf plant… not found in our area!! ((sigh)). I found a nursery that sells the plant on a trek to the Bay Area of CA. So different —I killed it😞 Recently I found some frons and lg leafs that look real… 1.de-clutter. 2.add frons. 🌿linda of no.cal. Wooo hooo on the junk drawer progress Linda! Small changes can be very much effective. Just love your pared-back look! And Modern Coastal is a perfect description! I’m doing the same in my home—getting rid of all but my most favorite decor! Just beautiful Janet! The mirror is absolutely perfect. It adds so mush light and life to the room. I’m so glad that you think so Joanne! I’m not a white farmhouse person over here and know what you mean 😉 Enjoy your weekend! JAnet, what a breath of fresh air your posts are! You are on to something here. The trends may be shifting. I am getting tired of the farmhouse, french country look, as it is too cluttered and filled with junk, albeit mostly charming junk! 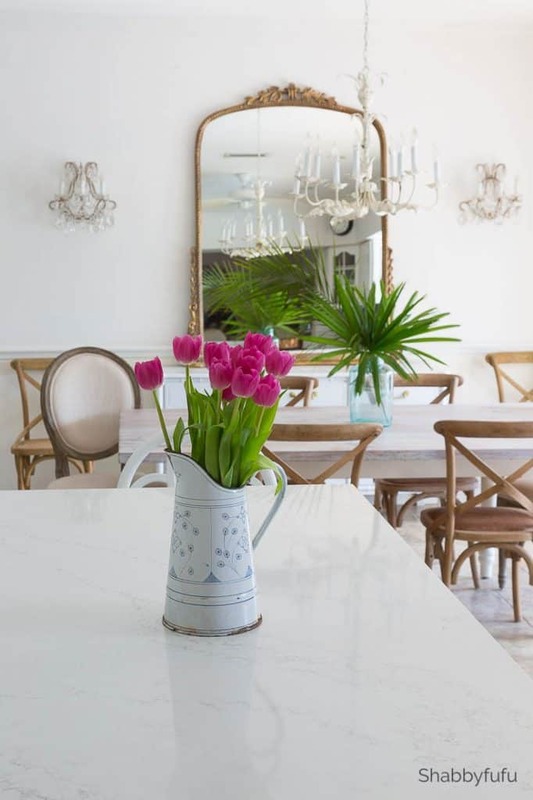 Love the mirror (it is such a statement piece)and the beauty of your tiled floor. Thank you so much Elizabeth! Yes…I agree that things need to shift and farmhouse is overdone. I’m still perplexed on a few more changes in my kitchen/dining room but will get there slow and steady. Happy weekend! Love the new mirror. I’m trying to figure out what size you used. If you used the 5′ mirror on top of a 30″ cupboard that would 90″. Most wall are 8′ or 96″. What size mirror did you use? I can’t tell from the picture. Maybe you have tall ceilings. Yes, we tall have tall ceilings and I did purchase the 5′ mirror. I love it in this space!